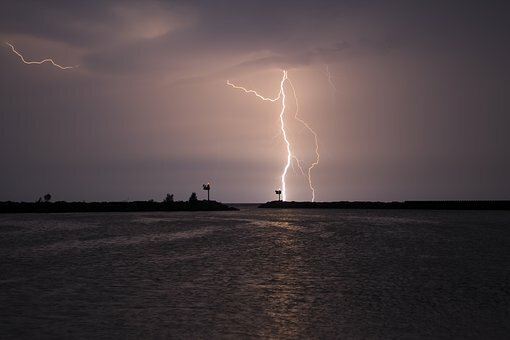 Jackson Browne used to croon about you loving the thunder (if you are old enough to remember), but most of us know that thunder is almost always a prelude to lightning, which can be very dangerous, especially if you are on the beach. Whenever you hear thunder, it means you could risk getting struck by lightning, so it is best to immediately seek shelter. As the saying goes, “When thunder roars, go indoors!” If there is no safe shelter nearby, a good option is to get in your car – where you are grounded by rubber tires – and wait out the storm. Lightning doesn’t just strike. It can create deadly electrical currents that run along the ground up to 100 feet away from where it strikes! So, if you find yourself with no shelter, crouch low with as little of your body touching the ground as possible until you can find somewhere safe. Don’t touch anything metal and stay away from any tall objects – like trees or poles – that could act as receptors for lightning. Just don’t get totally complacent once you are indoors because nearly one-third of lightning strike injuries happen inside! Lightning can travel through metal wires in concrete flooring and walls. Also avoid water because lightning can travel through plumbing. Avoid the use of electrical equipment – such as stereos, televisions and corded phones – for the same reason. Lightning is certainly no joke. We all need to respect it. You should also suspend all outdoor activity and questionable indoor activity at least 30 minutes after the last clap of thunder – just to be safe.